Abe's Lighthouse, 35 km to Dublin, this lighthouse was founded in 1654 by the Hanson Family. Two days later, on the way to the lighthouse. Hey, that's my suitcase! Oh,no, this poor dog needs my help! Wait, don't shoot! Get out of here. This is Abe's place, andonly his rightful heir can go inside! She's not kidding, without Abe's will, she won't let me pass! I must find the will in my suitcase. 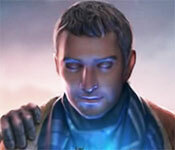 This game has a free trial version, click to start Edge of Reality: Hunter's Legacy Game Download. If you like it, please buy the full version to support the developer, thanks.